Parkinson’s Disease(PD) is a chronic degenerative movement disorder that effects approximately one million people. It is the most common movement disorder and second most common neurodegenerative disorder in The United States. The staff at Princeton Care Center understand that individuals diagnosed with PD have particular needs and do best when programs are in place that can provide the specialized care needed to ease the burden of living with PD and provide the best treatment and rehabilitation available. 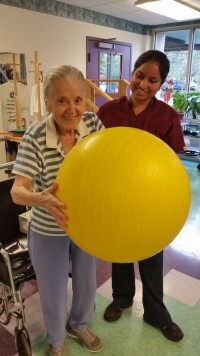 The team at Princeton Care Center has gone through specialized training to provide world class care and rehabilitation specific for people with PD in both our Sub Acute Rehabilitation Unit and Long Term Care Facility. 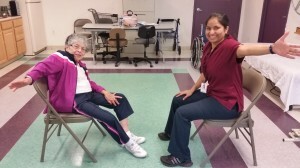 Our nurses, certified nursing aids, physical therapist, occupational therapist, speech therapists, and recreation staff have all completed training on how to best help individuals manage their care. Our Physical Therapist, Occupational Therapist, and Speech Therapist are certified in the LSVT BIG and LSVT LOUD modalities for treating patients with PD. Our rehab staff members are part of an elite group of 15,000 therapists in 54 countries specially trained to provide the most beneficial rehabilitation available. Our dedicated therapists will work one on one with individuals in training and exercise regiments designed to improve mobility, balance, endurance and strength. Speech therapy will teach patients techniques to strengthen the volume and clarity of speech as well as assess swallowing and eating ability. The overall goal is to not only preserve, but improve physical ability so that independence and an active life style can be maintained. Princeton Care Center is a 119 bed state of the art facility located in a park like wooded setting in the heart of Princeton. Our center is family owned and operated and has been providing quality care to the Princeton community for over 40 years. Princeton Care Center accepts Medicare and most health insurances. Please contact us to answer any questions and to arrange for a tour.